Christian Media in Nigeria : Free 2 Worship Concert: Kayode Olusoji, Mike Abdul, Sabina and Prealm, Others To Minister! 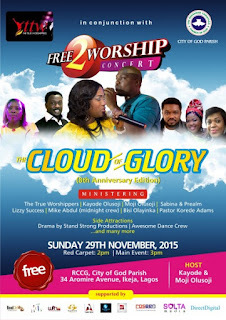 Free 2 Worship Concert: Kayode Olusoji, Mike Abdul, Sabina and Prealm, Others To Minister! Another edition of Free 2 Worship Concert is here! If you have ever attended any of the previous editions of the concert, where people receive an unusual grace to praise and worship God in a unique way.you will not want to miss this one. The Theme of this edition is 'The Cloud of Glory' and the line up of ministers are as follows: Kayode Olusoji, Moji Olusoji, Mike Abdul (Midnight Crew), Sabina and Prealm, Pastor Korede Adams, Bisi Olayinka, Lizzy Success, Awesome Dance Crew, Stand Strong Productions and many more. Come 29th November, 2015 at RCCG City of God Parish, 34 Aromire Avenue, Off Adeniyi Jones, Ikeja, Lagos, the power of God will be demonstrated in an awesome way through praise and worship! Red Carpet starts at 2pm and the main event at 3pm. Free 2 Worship Concert! An initiative of Kayode and Moji Olusoji.